I’ve done it. Four and a half months training a grand total of over one hundred and fifty miles, and consequently nearly thirty pounds lost led up to the day I planned before even giving birth to Ollie this April. I ran my first half marathon on Saturday. Last year, for our fifth anniversary, Caleb and I went to Michigan for a getaway, during which we stayed at the renouned Grand Hotel on Mackinac Island for a night. And, of course, we fell in love with the island and all of its old fashioned beauty. Not a single car can be found on the island. Horses and carriages and bikes are seen everywhere you look, as are the gorgeous houses and properties of Mackinac locals. The charm of this place is tangible, and one cannot help but leave it feeling uplifted. That said, early this year, when looking up races to enter, I stumbled upon The Great Turtle Race on Mackinac Island. Caleb excitedly told me he would gladly take me back to Mackinac if I could train to run the half marathon. At the height of inspiration, I promptly asked my sister in law, Suzi, if she’d want to run it with me and make a weekend getaway out of the trip. To my delight, she said yes! And after the next several months of running and planning and running some more, the day finally arrived. Suzi and her husband Phil, and Caleb and I, plus Mr. Ollie, drove up to Mackinac for the race. We stayed in a house on the water for Friday night, and took the ferry to Mackinac Island for the day on Saturday. Despite rainy (and consequently muddy), windy and cold conditions, we plowed through and made it to the finish line in 2:57, my personal best time by ten minutes. I was glad for the change of course from pavement to trail and back again, since I was concerned my knees would bother me. And since the rain caught us early on in the race, we dried off after a while and kept cool during our run. We saw beautiful house after beautiful house, each more impressive than the previous one, which helped the run to feel quicker. I loved it. Not every single minute of it – it was challenging for sure – but I loved that I was finally working to accomplish the goal I’d worked toward for four and a half months. I loved being around the other runners, this being my first ever race. And I especially enjoyed being with Suzi, who faithfully stuck with me though she could have made a significantly better time otherwise! I was unsure how the end would be, and crossing the finish line truly was emotional. Something in me gave way the very second I stepped over the marker, and tears fell as the relief of finishing rushed through me. I was done. It was finished. 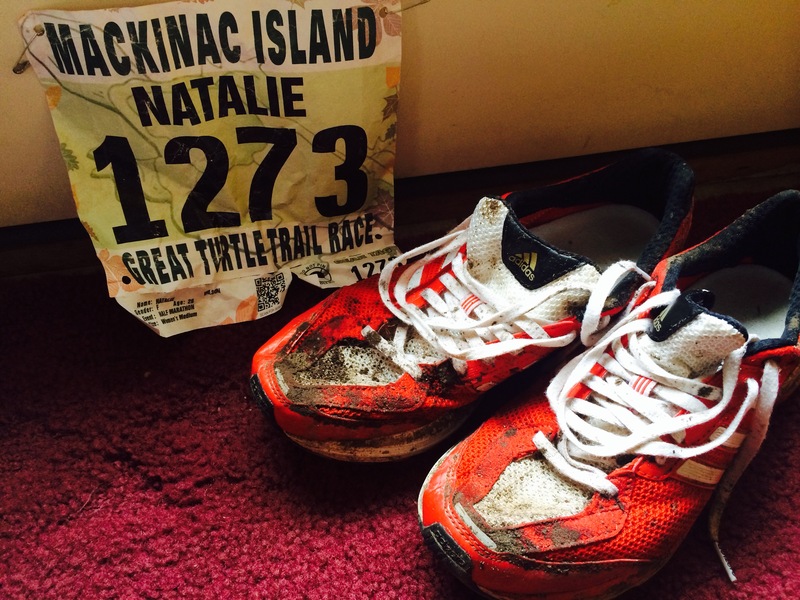 With my own two feet, I ran a 13.1. But the accomplishment hardly belonged to me alone – without my encouraging friends, family, and husband, I very well could have given up and decided it wasn’t for me. Caleb and Mom W watched the kids numerous times so I could go on my long runs, and I was kept accountable by friends and family who would check in with me every so often to see how the running was going. So, to all of you who helped me to the end, thank you so very, very much! For your encouragement, for your support, for your patience while listening to me blabber on about running, for your prayers. I mean it from the bottom of my heart when I say I could not have done this without you. Thank you to my beloved Husband, Caleb, to my parents who watched Cillian and Lucy, to Caleb’s parents who watched Jamie and encouraged me constantly while watching me run three miles, five miles, eight, ten…, to Phil for helping plan and execute the trip, and especially to Suzi, for sticking by me and pushing me til the very end. I love you all dearly. On to the next fitness goal! For the month of November, I’m planning to keep up with running (after I enjoy my week-long celebratory sabbatical), do a plank challenge, a squat challenge, and an arm strengthening challenge. In other news, I’m back at blogging! I’ll keep you posted. More updates coming. It’s been a while. I hope you have a terrific Tuesday. Again, good job dear! And so glad to have you blogging again! Hooray!!!! I’m so proud of you and totally inspired!